"Beauty is in the eye of the beholder and it may be necessary from time to time to give a stupid or misinformed beholder a black eye." Click here for definitions of difficulty levels. Custom fitted width, approx. 4" (10cm) high at apex. *The required safety gear is widely available at hardware stores. We got goggles that were rated for chemical spills as they provided full, eye-encasing protection. They also fit comfortably over Zabet's glasses. 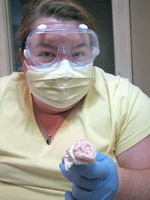 Our masks and gloves were obtained from a dental hygienist sympathetic to our salty cause. Please read this safety information before starting the project. You are going to be working with an enzyme that bonds protein. You are made of protein. Unless you want to glue your lungs together or glue your eyelids to your eyeballs, you absolutely must follow these safety rules. We cannot be held accountable for any mishaps you might have while working with transglutaminase. 1. Wear protective gear: goggles, gloves, and face masks. Also wear long sleeves, long trousers, and closed-toe shoes. 2. Work in a well ventilated area. 3. Do not work around pets, children, or adults who are not also wearing safety gear. 4. If any area of your body comes into contact with the transglutaminase, flush it thoroughly with water and consult a health care professional. 5. Read the MSDS for Activa TG-RM. After storing unused transglutaminase, we also recommend running a HEPA air purifier for 60 minutes (longer for larger spaces) prior to removal of safety gear. You can likely get very similar results without any TG at all, due to the nature of ground meat wanting to stick together during cooking. This type of TG only has a working time of about 30 minutes, so you'll want to have everything ready beforehand. Preheat oven to 350ºF (175ºC). Cut the wire mesh to a piece about 10"x10" (25.5x25.5cm). Gently bend it into a curve. 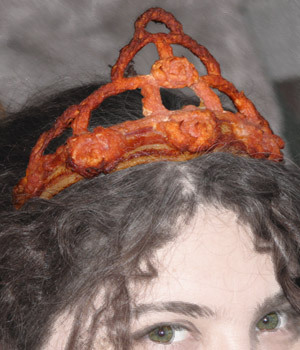 Try it on as a tiara, and modify as necessary until you have a good fit (bend it more, trim the width down, etc.). Set the mesh down on a table, convex side up, and cover with Teflon-coated foil. The Teflon side should be facing up. 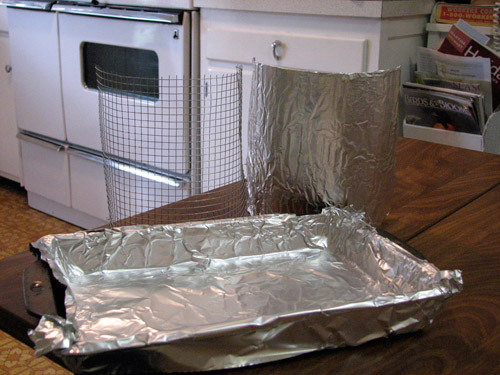 Tuck the foil under the edges to secure it. Use the pencil to poke drainage holes in the foil. Lay the two slices of bacon down on the mesh-and-foil mold, then place the mold on the baking sheet. Gently tug and tuck the ends of the bacon strip under the edges of the mold to reduce shrinkage. Make sure that the center ends of the bacon slices overlap by at least 2". Trim all fat off the Irish bacon (there won't be much, but it will help immensely). Prepare a pastry bag with a round tip and cover the flower nail with Teflon-coated foil. Switch to the petal tip on the pastry bag and prepare to create the meat roses. Place a small piece of aluminum foil over the flower nail. In the center of the foil with the small end of the petal tip up, squeeze the meat paste into a cone shape. This is the center of your rose. 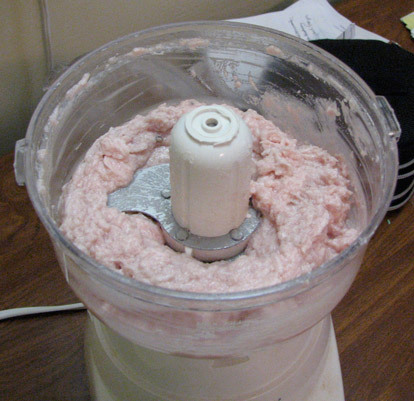 Continue to squeeze out short strips of meat paste while rotating the flower nail in the fingers of your other hand. Remember to stop completely and pull the tip away when finishing a petal. Start the next one by slightly overlapping the petal you just completed. Continue to create petals until your rose is as full as you wish. 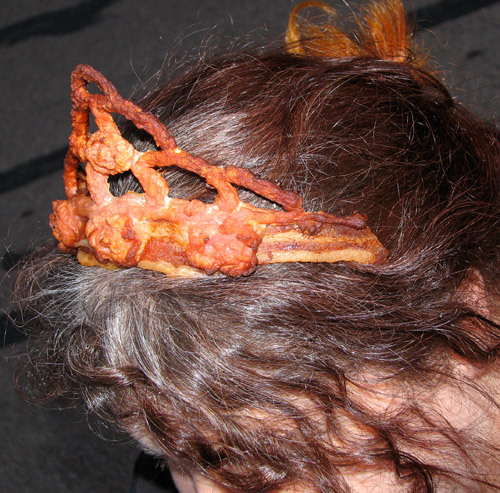 Place the roses strategically to hide where the piped bling meets the headband bacon strip, and wherever else you like on the tiara. To move the roses from the nail to the tiara, use the flat of a knife. Place the baking sheet in the oven and cook it to your liking. Honestly, we sort of forgot about it and probably let it go for about 45 minutes. Just check on it often. If it seems to be browning too fast in spots, cover it with some foil and let it continue to cook until it is no longer soft. If you find the outside edges are too brown compared to the pinkish middle (where the meat was thicker, as in our picture), use a kitchen torch to carefully brown the pinker middle bits. 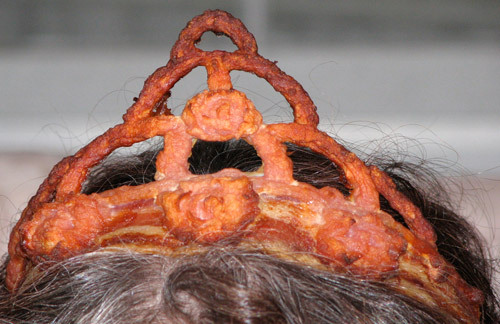 Put on your best beauty queen smile and practice your royal wave—honey, you're a Pork Princess!